Mario + Rabbids Kingdom Battle was one of the more surprising mashups of recent years, perhaps more so because it actually turned out to be very good, with Ubisoft blending just the right amount of Mario's charm with an appropriate dose of Rabbid-inspired chaos. The secret sauce that helped it succeed was the way Ubisoft took both properties into completely new territory, and even with Mario and the Rabbids outside of their respective comfort zones, they still managed to shine thanks to its generous approach to Xcom-inspired tactical combat. So after impressing us last summer, it's time for the Rabbids part of the team to make a return, this time with Donkey Kong taking the place of the famous red plumber in the lineup. Rabbid Peach returns, this time accompanied by Rabbid Cranky, in a four-chapter DLC campaign that seems to do just as good a job of mixing up ingredients as the base game did before it, with loads of suitably reverent nods towards another of Nintendo's most iconic characters. 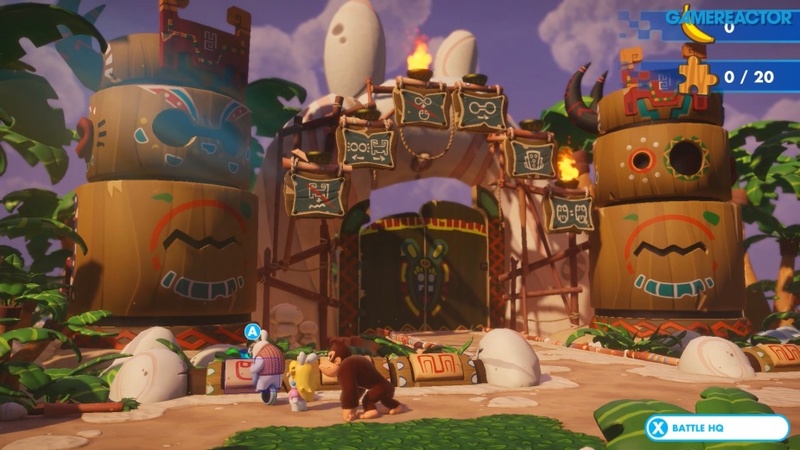 This time around Rabbid Kong is out to cause trouble, and there are washing machine parts out in the various stages (we caught a glimpse at three of the four new locations - the Village, Reef, and Jungle) that Donkey Kong and his Rabbid entourage has to collect in order to win the day. We're not quite sure how. Yeah, the premise is just as bonkers as it was the last time, but that's part of the game's unique charm and, once again, it works. As you explore the overworld your characters once again form a conga line, dropping into missions as you discover them, and always collecting bananas while you explore. Indeed, picking up bananas instead of gold coins is just one of many examples or how Ubisoft has imbued these new environments with the spirit of Donkey Kong, and everything from the world design itself to the descriptions in the skill trees is referential in some respect. However, while a tropical theme is certainly a nice wrapper for these new missions, it's the gameplay tweaks and new abilities that should set this roughly ten-hour DLC campaign apart from the base game. Traversal is one of the biggest changes. Mario + Rabbids was certainly generous in how it let players move around the environment, stringing together movements by jumping in pipes and flinging your teammates to advantageous positions, but now there are blue platforms that Donkey Kong can use to jump across extended distances, and when these are utilised with care it can help the angry ape to flank his opponents and get up close and personal. He needs to, because while Rabbid Peach and Cranky have options at range, DK is very much a melee fighter, a shift that will impact on your overall playstyle. While DK can throw bananas using his Potassium Pulveriser or Bwananarang attacks, he's at his most potent when getting stuck in with Ground Pound, or when he throws his opponents at each other. If your enemy is too far away though, DK will bust out the bongos and entice them in with a melodic tune. His added health points also mean that you can take a few extra risks when pushing forward, and with two more characters used carefully in support, players can and should take the game to their AI-controlled opponents. While Donkey Kong might be at his most effective in close quarters, Rabbid Cranky, on the other hand, offers a bit more range. He can fire his shotgun-like Boombow, or fire explosives using his Barrel Bolt, but either way he's suited to providing aggressive support from mid-range. Once again the more exciting attacks are on cooldown timers, so you can only use them occasionally during each mission, however, there's a nice blend of dovetailing abilities to choose from and, along with Rabbid Peach's abilities, the team seems to work well together. There are new skills trees on offer too, and some of the abilities sounded great. We only really had time to unlock a couple, but upgrades including the Habanero Caballero (which is an improvement on the Bwananarang and lights a fire under the little Rabbids, sending them running out of position while they clutch their burning backsides) certainly seem to offer further variation as they're earned and experimented with. The extent of their variety and how they impact on later missions will become clear when we play the full campaign, but the early signs are good thanks to a decent selection of thematically strong abilities and attacks. 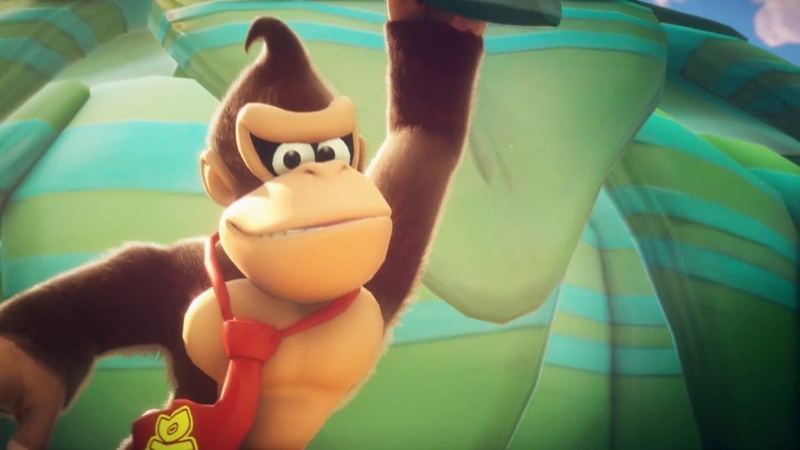 In some respects this Donkey Kong themed DLC seems to offer more of the same brand of tactical gameplay that we enjoyed in the base game, but the changes made to the formula as Mario passes the baton over to Donkey Kong seem well thought out and in keeping with the spirit of the original. We'll find out more when it's time to sit down and play it through to completion, with the Donkey Kong DLC campaign set to land on Nintendo Switch in June.